While google-reading lately, I came across several mentions of Cammie (Carolyn King)'s efforts to host a challenge to benefit something that is very dear to her. So I checked it out, and she has asked for all who participate to please send a thank you to someone who cares for Alzheimers patients. Please see this post for details. A lot of companies and individuals have donated approx. $1000 in products for the random lucky winner that posts the card he/she sent for this cause. I am glad to be able to participate in this challenge - I know how very difficult it is to be a caregiver! So here's my very simple card that will be sent off to hopefully brighten someone's day by letting them know they are appreciated! Will you join this cause? Excellent card! It's a true Becky original! That's so awesome of you to do this! 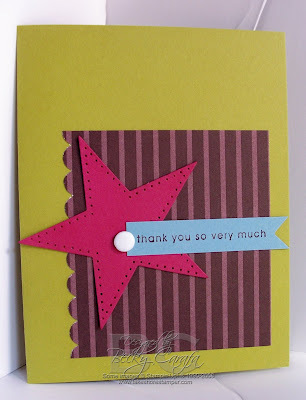 Love the card too, the star is fantastic! you sure do know how much goes into being a caregiver, I think you deserve your own card! love this Becky-you do wonders with those stars! great one.